There is a creative edge in each and every one of us. Somewhere deep down inside of you, there is a unique way for you to express yourself, creatively. You might not be an inspiring Pablo Picasso, or another Michelangelo Buonarroti, but there is something that you are good at that is waiting to materialize. If you don’t have a clue what it might be, start out with something simple, like playing around with some watercolour paint and a pad of watercolour paper. Splash with the brush and portray what you see in front of you. Or grab a pencil and some lined paper and begin to journal. Write what comes into your mind, the thoughts that appear when you are sitting still. Don’t be too hard on yourself, this is the key. We can be our own biggest critic when it comes to displaying our creativity. Nothing is ever good enough or has the slightest resemblance to what we had in our minds eye. That is ok, the idea is just to allow ourselves the opportunity to try. Engaging in something that we enjoy, creative or not, is such a great way for us to get out of our head, a chance to escape our Ego, if only for a short period of time. Do you know there are a lot of celebrities that knit? Brigitte Bardot, Robin Williams, and even Audrey Hepburn. They all engaged in the art and creativity of knitting because it was a way for them to disconnect. This is what doing something with our imagination gifts us, a chance to find peace of mind. 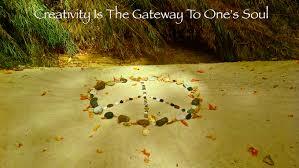 If it’s not painting, knitting or writing then try something creative in your garden or with the sand on the beach. There is nothing wrong with big grown ups making sand castles. The moral of this story is don’t be afraid to try something new. Treat yourself to some art supplies or a pencil or two and see what happens, I bet you will be really surprised. Have a happy day, and let you imagination run free.